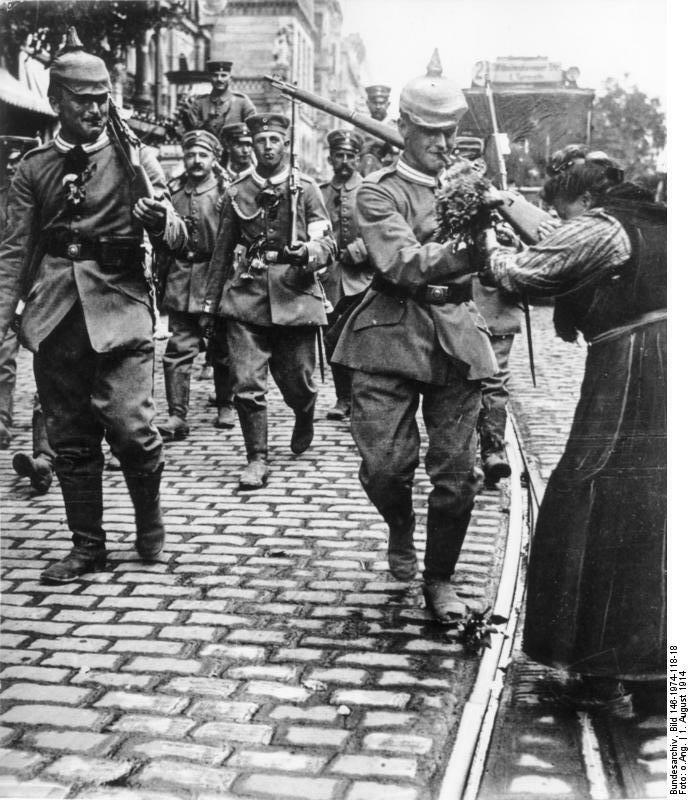 Stopped short of Paris during World War I, the Germans thought they could still win the war with giant guns terrorizing the French capital. World War I’s stalemate on the Western Front ushered up varied solutions. The Allies developed tanks for traversing no man’s land to get at the enemy. But tanks had faults: Artillery could stop them, so could mechanical problems and difficult terrain; and they could not get the job done without lots of infantry. Across the trenches, Germans had little regard for tanks and produced but few models. The main effort by the Germans lay in the application of the Hutier Taktik, the forerunner of the Blitzkrieg of 1939-1940. The Hutier demanded a narrow front, advancing without regard to the security of the flanks. Follow-up troops were detailed to deal with strong points that had been by-passed. It was an approach that worked well on the Eastern Front, but less so against the entrenchments in the West because the French and British armies were more stable and because the Germans could never amass enough stormtroopers. So from the time of the Battle of Verdun in 1916, the Germans looked to one of their strong suits: their ability to produce very heavy artillery of superlative quality. General Erich Ludendorff, head of the Supreme War Council, was approached by naval officers commanding the very heavy guns on the Western Front (in almost all armies, large-caliber railway guns were served and maintained by naval personnel). Their proposal was to introduce guns capable of firing a shell 100 kilometers, or 62 miles. Such guns would require a heavy commitment in funding, materiel, personnel, and technological resources. Ludendorff has been depicted as a cold, reserved officer lacking imagination. But in this instance the man immediately grasped the possibilities. At that time, Paris was only 90 kilometers, or 60 miles, behind the Allied lines and would be vulnerable to such weaponry. It was the hub of the railway network of France. It was the major industrial center of the French armaments industry and, of course, the political capital and administrative center of the French government. Ludendorff recognized an attractive target when he saw it. He reasoned that artillery with the capacity to blast Paris might be the German answer to the horrors of the frontal assault. Instead of battering at Allied trenches, punishing Paris would be the means to destroy the heart of France; the rest of the body would wither on the vine. The lesson of Verdun was engraved on the hearts and minds of both sides. Commanders as well as fighting men were increasingly reluctant to launch a frontal assault. Thus Ludendorff was quite taken with the possibility of going over the lines instead of trying to go through them. Dazzled by the proposed technological leap, the projected results of such massive guns were aggrandized, and the ballistic limitations were minimized. All artillery manuals contain “dispersion tables” that provide mathematical calculations of the predicted fall pattern of shells. Dispersion is caused by many factors including air temperature and density, temperature of propellant, age of launching explosive, apparent and actual wind over the trajectory of the shell, plus a host of other esoteric variables. In addition, the rule of thumb is that the higher the charge level, the greater the breadth of dispersion. Firing the charge necessary to reach Paris would engender an extreme dispersion factor. It was quite possible to hit a target the size of Paris, but pinpoint accuracy was just not in the cards. Nevertheless, German planners believed that because the French were a volatile people, the effect of Paris coming under artillery fire would be devastating. The assembly of dispersion tables is a laborious procedure requiring a tremendous number of man-hours devoted to calculations, now performed by computers. The amount of labor required to manually assemble dispersion tables is staggering, and the end product is error prone. Dispersion is an accepted factor, and any battery servicing a target has to fire groups of shells to achieve any expectation for a respectable number to be on target. But with such long ranges as anticipated by the proposed massive guns, new complications had to be considered. The Germans would have to take into account the calculations of the French mathematician Gustave Gaspard Coriolis (1792-1843). Coriolis had been an assistant professor of analysis and mechanics at the École Polytechnique, appointed in 1816. He had reached prominence as the result of an innovative paper published in 1815 called Theorie Mathematique des Effects du Jeu de Billards (Mathematical Theory of the Game of Billiards). Coriolis had codified a basic principle of artillery, which was, “The angle of reflection is equal to the angle of incidence.” This proposition had been clearly demonstrated on billiard tables again and again, but extrapolating it to artillery was new. As any billiard or pool table habitué knows, a bank shot leaves the cushion at the same angle at which it arrived. Similarly, an artillery projectile will return to Earth at the same angle at which it left the muzzle. In April 1915 the Germans placed extreme-range naval guns on railway mountings. These were named Lange Max (Tall Max) in honor of Vice Admiral Max Rogge, who had supervised the adaptation of naval guns for land use. With a bore of 37.99 cm (14.96 inches), these guns could loft a shell 30 miles. Firing from Lugenboom, shells were reaching Dunkerque, 23.5 miles away. The guns were difficult to serve because the loading of a projectile and propellant, with an overall length of eight feet, could only be done from the horizontal position. Loading and relaying the guns for each firing was a labor-intensive, time-consuming project limiting the rate of fire. On the plus side, the guns were immune from direct retaliation. The Allied forces had no ability to deliver counter-battery fire, because the German guns were far out of range. The firing site and the target were on an east-west axis, which made the projectiles virtually unaffected by the Coriolis Effect. However, Professor von Eberhardt, an obscure mathematician working for Germany’s Krupp steel and weapons corporation, had been working on a method to extend artillery range, and understood the problems that firing on a north-south axis would produce. Eberhardt was a very minor technician, and despite his prestigious “von,” his credentials and first name are unrecorded. Ludendorff’s approval of the long-range artillery had set the Krupp apparatus into motion. The original specifications stipulated a range of 60 miles, later upped to 75. Krupp, probably the world’s most experienced manufacturer of artillery, began to put together such a weapon in its typically innovative fashion. Gun barrels with a 15-inch (38.1-cm) bore were practically an on-the-shelf inventory item. The design team was aware of the barrel erosion resulting from extreme charges and approached that problem in a novel manner. An interior barrel with a bore of 8.26 inches (20.98 cm) would be inserted into the larger bore and would bear the brunt of firing. When worn down by repeated firing, the subcaliber insert could be replaced with relative ease, preserving the exterior barrel. Nevertheless, the work was a major engineering undertaking. The gun was a composite affair, a complex assemblage produced by the renowned Krupp design teams. There was a barrel extension of 36 feet, 1 inch, forward of the original muzzle. On top of this was an additional chase (smoothbore) extension of 19 feet, 8 inches. The entire affair had an overall length of 112 feet, and a weight of 138 tons. Such a ponderous piece of artillery required external bracing to keep the barrel from sagging. 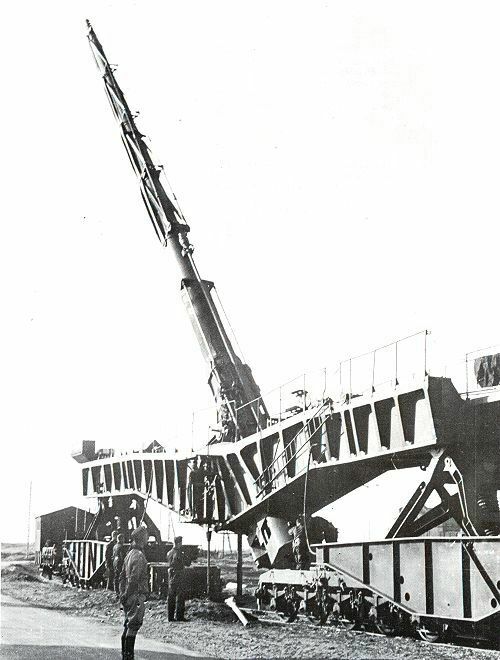 Supporting the barrel was a cantilever bracing that transferred part of the load to the base of the gun. The bracing looked very much like a model of one-half of the Brooklyn Bridge. Obviously this apparatus could be carried only on railroad wheels and required the special construction of reinforced trackage. The shell was to weight 229 pounds and was to be of novel design. Instead of using conventional copper driving bands, it would have two steel ones threaded to fit into the barrel’s rifling. Behind each driving band was a narrow copper band to act as an obduration (sealing) device. The loading drill required it to be screwed into the rifling. This mandated muscle power, and lots of it. Krupp engineers calculated how much metal would be worn away from the insides of the barrels with each firing. They determined that the service life of the barrel was 64 rounds before rebuilding would be required. To compensate for such wear, the shells were numbered consecutively and incrementally sized to compensate for the predicted erosion. Shells had to be fired in numerical order to preserve the fit of the projectiles in the increasingly worn barrel. Professor von Eberhardt had been hard at work on the super gun. He had calculated that in the near vacuum commencing 12 miles above the Earth, air resistance would be reduced to almost zero. Maximum range could be achieved at an angle of incidence of 45 degrees. To compensate for initial degradation of the nascent launch angle, firing had to be done at an angle of 50 degrees. To produce the ability to reach the required 12-mile height, the muzzle velocity had to be 1 mile per second. The shell would have to leave the muzzle 1/50th of a second after ignition and with a rotational speed of 100 revolutions per minute. To achieve the required muzzle velocity, the propellant charge had to be considerable. In addition, the powder had to be of the highest quality, with no deviations between batches acceptable. The charge was divided into three components. The lower charge of 154 pounds of powder was encased in a brass cylinder called a Hulsenkartuche, which gave support to the two forward charges. Above the brass cylinder was the Vorkartuche (main charge) of 165 pounds supporting the Zusatzkartuche (auxiliary charge). Both of the upper charges were encased in silken bags. The total charge was nominally set at 450 pounds, including the auxiliary charge of 112 pounds. The auxiliary charge could be adjusted by adding or subtracting powder to maintain proper chamber pressure. The gun itself could be fired at only one elevation. Range adjustments were made by increasing or reducing the charge in the Zusatzkartuche. With all the scientific calculations and engineering problems engendered by this project, the research of Coriolis was reviewed by Professor von Eberhardt, and an additional adjustment made. Having been advised that the projected firing site was in the forest of Crépy-en-Laonnois, near Laon, and the target Paris, he calculated the distance between the two as 67.6 miles. The firing vector was close enough to a north-south axis, bringing the Coriolis Effect into play. Coriolis and von Eberhardt knew that Laon and Paris were traveling at different speeds. Although each rotated once in 24 hours, Laon was farther from the equator than Paris and thus moving somewhat slower in miles per hour. A point on the equator travels at 1041.66 mph. Eberhardt estimated a rotational speed of 567.126 mph at Paris on the 49th parallel, and 555.55 mph at Laon on the 48th parallel. An adjustment of 11.576 mph, or .003215 miles per second, had to be provided for in the laying of the gun. The final calculations were assembled. To achieve the required muzzle velocity, a chamber pressure of 59,000 pounds per square inch had to be reached. Flight time was predicted at 176 seconds. This called for an easterly correction of 0.5659 miles or roughly 995.984 yards to compensate for the differing rotational speeds of gun and target. On March 23, 1918 everything was ready to go. The first shell burst without warning at 7:20 am at #6 Quai de Seine. With no hostile aircraft evident, the explosion was a mystery. At 7:40 am, a second explosion rumbled the Boulevard de Strasbourg a few feet from the Metro (subway system) in front of the Gare d’Este. This hit killed 8 persons and injured 13. The mysterious explosions continued with a hit at 8:05 am on Rue du Chateau Landon. The next hit at 8:17 on #5 Rue Charles Cinq. Number five landed at 8:35 at #24 Rue des Ardennes. By 2:45 pm 25 shells had landed. Experts gathered shell fragments and found some with steel more than 2 inches thick. Also found were fragments of copper, which were the obduration bands, displaying engraved rifling grooves. At 4 pm, authorities announced that Paris was being shelled by artillery of 24.0 cm caliber (actual size was 21.0 cm). At the time of the first firing, ordinary German artillery went into action in order to mask the sound of the “Paris Gun” from the very adept French sound-ranging system. Nevertheless the French soon determined that the monster cannon was coming from along a line connecting Paris to Laon. With the source predictably located in a forest, but with no precise location, spotting aircraft were immediately detailed to find the gun’s hideout. The size of the weapon made it obvious that this piece of artillery was practically stationary. The Paris Gun, also known as the “Kaiser Wilhelm Geschütz” (Emperor William Gun), was the largest artillery piece in World War I. The Germans were busy, too. The first firing had developed a chamber pressure of only 53,800 psi, which required an adjustment to the propellant charge. Initial calculations had predicted a target distance of 67.1 miles, but this figure had been based on a straight line moving through the Earth. The actual distance along the curved surface was 67.6 miles. Adjustments were made. The actual distance traveled by the projectile was 92 miles in a flight time of 176 seconds. The shell reached a height of 12 miles in 25 seconds with a velocity of 3,000 feet per second (fps). Degradation of the muzzle velocity was caused by the friction of the atmosphere and gravity so that at the apogee of the trajectory, which was at 24 miles into space, the shell was moving at a speed of 2,250 fps as it “went over the top.” Coming down on the reflective angle, speed increased, and at a height of 12 miles the projectile was again moving at 3,000 fps. In the final leg of its journey the projectile reached a terminal velocity of 3,075 mph. Its approach was soundless because it was traveling at more than the speed of sound, Mach 3.5 actually. Its travel sound would not arrive until well after the explosion. The French government hastily implemented countermeasures. Within 12 hours of the first hit, a battery of 12-inch railway guns was sent to Vailly, the nearest point to the firing site suitable for counter-battery fire. But not surprisingly, French aircraft reported a heavy smoke screen over the entire Laon corner to mask activity on the ground. 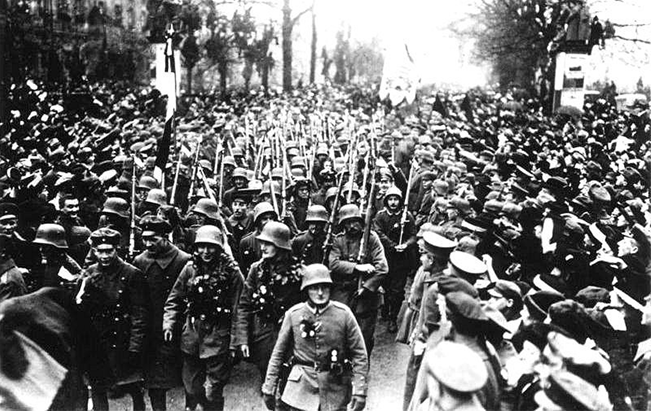 The Germans resumed firing the next day, Palm Sunday. They continued on Monday and then stopped for three days. They took it up again on Good Friday. At 4:30 pm, in Ste. Gervais Church opposite the Hotel de Ville several hundred were at prayer. A direct hit on one of the stone pillars supporting the vault of the nave brought the structure down onto the worshipers. Eighty-eight persons were killed, including 67 women and two children. One hour later, a subsequent shell landed in a nearby cemetery. By April 6, 1918, counter-battery fire was beginning to approach the first “Paris Gun.” In addition, wear was becoming evident. After 48 rounds the gun was declared worn out and in need of being rebuilt. A second gun went on line, but by May 1, after firing 64 rounds, it, too, was declared worn to the point of necessitating repair. In addition, the French artillery had landed over 3,000 shells in increasingly close proximity to the firing site and it was only a matter of time before a direct hit would register. A third gun was installed and inspected by the Kaiser. After a lunch at the site and after expressing his satisfaction, he ordered firing to commence the following day. It did, all through that Sunday and part of Monday. Then a hidden flaw surfaced. The gun exploded and killed most of its crew. On May 27, the Germans installed a newer, larger gun at Beaumont, about nine miles closer to Paris. This gun proved more durable and fired 104 shells before being declared in need of repair. Then a French offensive threatened it and it was withdrawn. By July 15 the Beaumont gun was back in the fray after being rebored and refurbished. After firing only 14 rounds, it had to be withdrawn again from the advancing French. Resited again, it shelled Paris from August 5 to 12 with 64 rounds. Again it had to be withdrawn in the face of being overrun. In all, 367 shells struck in or about Paris. But no vital installations were hit. The attractive target was not as vulnerable as Ludendorff anticipated. For one, the guns were incapable of the accuracy necessary to service individual targets. Spotting aircraft could not be used owing to communication limitations and the presence of large numbers of French aircraft in the area. Even if they were employed, adjustments for pinpoint accuracy were simply beyond the ability of the gun crews. Dispersion of hits had been very wide but shells had predominantly landed on a northeast/southwest line mainly in the 7th, 10th, and 19th Arrondissements, which were mostly residential areas. Rail concentrations, armaments plants, and government centers, the targets that Ludendorff had thirsted for, were not damaged. Total casualties reached 250 killed and 620 injured, mainly civilians. The actual effect on Parisian morale and the French war effort was insignificant. Considering the investment in men, materiel, and exertion, the “Paris Guns” could not be considered compensatory. That autumn, the Allies drove the Germans back toward Germany until the Germans called for an armistice. In World War II, of course, the Germans would again reach for far-striking weapons of terror, the V-1 and V-2 rockets. These had course correction mechanisms on board and required far less Coriolis Effect calculations. Although the V-1s and V-2s were more sophisticated, the launching of a projectile over a range of 69 miles with a fair degree of accuracy was a major achievement in 1918. Professors Coriolis and von Eberhardt had shown men the way for the first time—albeit bloodily—to blast ballistic missiles out of Earth’s atmosphere and into space. Tags Allies, Allis, Ardennes, artillery, Axis, Battle of Verdun, Blitzkrieg, British, cannon, CIA, cod, EAM, Eastern Front, Erich Ludendorff, France, French, general, German, Germany, HBO, Hutier Taktik, Krupp, NSA, OSS, Paris, Paris Guns, Pola, POW, Tanks, Tern, the blitzkrieg, The Eastern Front, The Western Front, Thor, Tory, Troy, Verdun, weapons, Western Front, WIN, World War I, Zero.